SEATTLE  The release of Nike's new Air Jordan basketball shoes caused a frenzy at stores across the nation early Friday, with police using pepper spray on a group of rowdy customers near Seattle and officers arresting some shoppers after a crowd broke down a door in suburban Atlanta. The crowd started gathering around midnight at four stores in the mall and had grown to more than 1,000 by 4 a.m., when the stores opened, Murphy said. "Around 3 (a.m.) there started to be some fighting and pushing among the customers," he said. "Around 4, it started to get pretty unruly and officers sprayed pepper spray on a few people who were fighting, and that seemed to do the trick to break them up." No injuries were reported, although some people suffered cuts or scrapes from fights, Murphy said. The crowd broke off a door. One man was arrested for assault after authorities say he pushed an officer. About 25 officers from Tukwila, Renton, Kent, Seattle and King County responded. They smelled marijuana and found alcohol containers at the scene, he said. Murphy said the crowd was on the verge of a riot and would have gotten even more out of hand if the police hadn't intervened. "It was not a nice orderly group of shoppers," he said. "There were a lot of hostile and disorderly people." The stores sold out of the Air Jordan 11 Retro Concords, and all but about 50 people got their Nikes. Hundreds of customers also lined up outside shoe stores in downtown Seattle and at a mall in Federal Way. 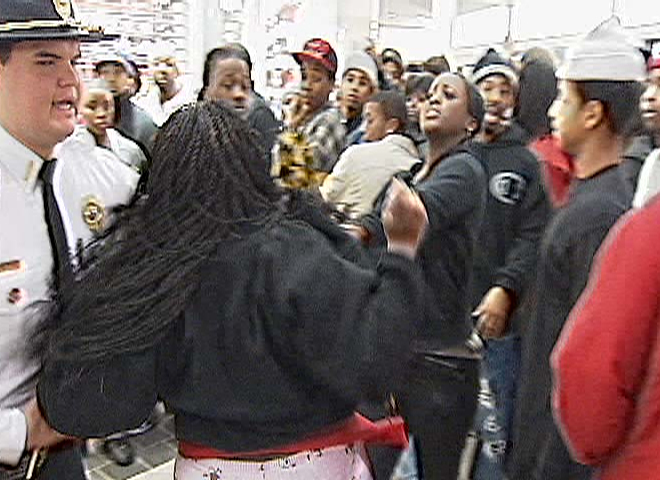 Similar unrest was reported at shops and malls across the country. In Lithonia, Ga., up to 20 squad cars responded to The Mall at Stonecrest when a large crowd broke down a door to get inside before a store opened. At least four people were arrested. Police said they also had to break a car window to get two toddlers out after a woman left them to go in after the shoes. They said she was taken into custody when she returned to the car. Charlotte, N.C. affiliate WBTV reports that dozens of police officers had to break up fights and restore order at a mall in Pineville, after about 200 people who had been waiting pushed inside. The disturbance inside Carolina Place Mall started just after 5 a.m. When officials opened the mall doors, crowds of people pushed their way in. "They almost took the door off the hinges," said one shopper who didn't want to be identified. "There were women with babies in their hands and they on their backs." Outside the Foot Locker on the second floor, witnesses said some shoppers started jumping the line; then, a crowd of people at the back of the line forced their way to the front, angering many. The scene became unruly. A WBTV cameraman captured two women throwing punches. Neither woman was arrested. "Overall, it was a successful event," Carolina Place Mall General Manager Susan Barwick said. At nearby Northlake Mall, shoppers forced the mall doors open, taking the sliders off the hinges. Police responded, sending 40 officers to the scene. One person was arrested and charged with resisting arrest, a police spokesperson told WBTV. In Indianapolis, CBS Affiliate WISH reports a crowd of about 300 people surged their way into the main entrance of the Lafayette Square mall, pushing and shoving their way into the mall prior to opening, literally ripping the doors off their hinges. Dispatchers told WISH officers at the mall were "having problems" after the store apparently sold out of shoes. Additional officers were called in to help manage the crowd. In Taylor, Mich., southwest of Detroit, police said about 100 people forced their way into the Southland Mall about 5:30 a.m. Friday, damaging decorations and overturning benches. More than 300 people were lined outside the mall southwest of Detroit. A 21-year-old man was arrested. Four other police departments were called in to disperse the crowd. The Kalamazoo Gazette reports that about 300 people waited at The Crossroads mall in Portage in southwest Michigan. Police were called to disperse the crowd. Not all the shoes were destined for the feet of their buyers. WISH reports that within two hours of the shoes going on sale, at least five pairs were for sale online by Indianapolis-area eBay users, selling for up to $500.